The WIA has provided this page of information for the benefit of members to assist station licensees on how to measure transmitter RF power so as to comply with their respective licence conditions contain in the Radiocommunications Licence Conditions (Amateur Licence) Determination No. 1 of 1997 (LCD). Additional information on maximum tranmitter power levels and emission modes is contained in a document at the bottom of this page. To assist Advanced Licensee, who have applied to the ACMA for a licence variation for High Power operation on HF, additional information in respect EMR so as to comply with the requirements of the Human Exposure Limits of the ARPANSA Standard. The WIA wishes to thank the ACMA for its assistance with the content of this section. Standard RF power measurements are conducted using a non-radiating artificial antenna (dummy load) with a standard impedance of 50 ohms. 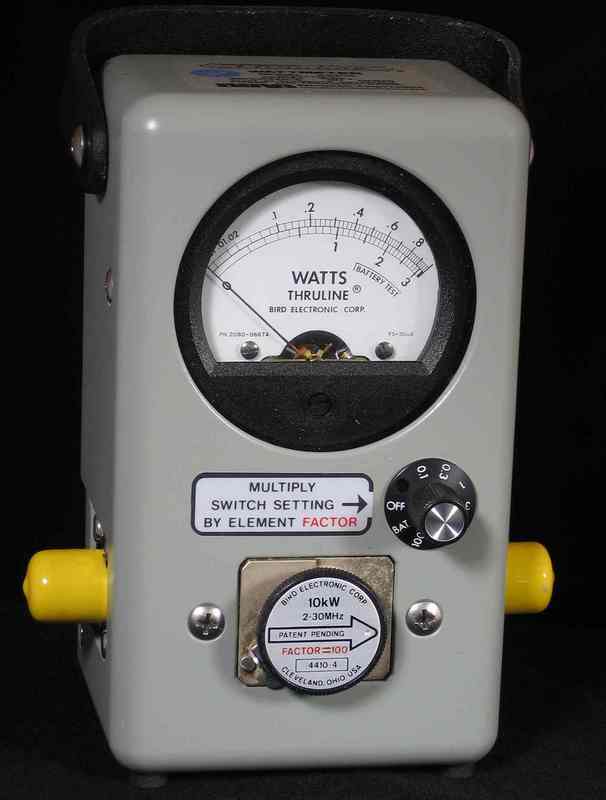 The load should be capable of handling the rated power of the transmitter to be measured. The measurement device can be a combined indicating meter and artificial antenna or a combination standing wave ratio (SWR) meter and a separate artificial antenna. All measurements are only valid if the SWR is equal to 1:1. It should also be noted that measurement devices will have of plus or minus percentage tolarence for full scale deflection. For example, the industry standard Bird 43 watt meter has a tolerance (measurement uncertainty) of 5% for mean power and 8% for peak reading devices. Power measurement devices should to cross calibrated against a known calibrated measurement instrument. The sum of all measurement tolerances and measurement uncertainty should be allowed for in measuring RF power. Transmitter controls such as compression device should be de-activated. The setting of Microphone gain and Drive controls should be in accordance with the manufactures recommendations. If an external RF power amplifier is used, the Automatic Limiter Control (ALC) settings should be in accordance with the manufactures recommendations and turned on. The Amateur Service in Australia is not bound by any equipment standards as such, other that the general provisions of the Radiocommunications Licence Conditions (Amateur Licence) Determination No. 1 of 1997. In considering RF power measurement techniques, the ACMA has recommended that the provisions for power measurement contained in AS/NZS standards for technical performance should be used. In general terms peak envelope power (PEP) only applies to Single Side Band (SSB) phone emissions. For Amplitude Modulation (AM), Frequency Modulation phone emissions, and Digital mode emissions, Mean Power is used for RF output power from transmitters/amplifiers. For Continuous Wave (CW) morse code emissions, Mean Power is used to determine the RF output power and is measured with the morse key held down. The test case is extracted from the AS/NZS4770 (HF Land Mobile Standard). The transmitter/amplifier is connected to the artificial antenna. A calibrated mean power is connected to the transmitter. The transmitter is modulated by two non-harmonically related audio tones applied simultaneously. The recommended tones shall be 700 and 2300 Hz and at a level above that required to driver the transmitter/amplifier to the ALC threshold point. The two-tone input is adjusted to maintain equal tone levels at the transmitter for maximum power output coinciding with linear operation, as indicted visually on an oscilloscope that may be connected across the artificial load or coupled off air. The resultant mean power with only the 700 Hz tone present is recorded along its peak voltage level from the oscilloscope. The two tones 700/2300 Hz are then applied simultaneously, the peak voltage from the oscilloscope is recorded. The peak envelope power is then calculated using the formulae at clause 6.2 of AS/NZS4770. V2 = peak voltage with only 700 Hz tone applied, in volts. The peak envelope power should not exceed the respective authorised power for the type of station licence held by the licensee. On completion of the measurement, with a microphone connected in place of the two tone signal, the microphone gain control may be adjusted to ensure the voltage measured by the oscilloscope is not exceeded under modulation and the waveform at this level is consistent with linear operation. The test case is extracted from the ASNZS4295:2004 (Land Mobile Standard). The transmitter/amplifier is connected to an artificial load and in the absence of external modulation the mean power delivered to this load is measured. It should be noted, however in the case of amplitude modulation, that is double sideband full carrier, when a microphone is used to modulate the transmitter, the RF power output for 100 percent modulation increases 1.76 dB. In this case the RF power on voice peaks should not exceed the peak envelope power limit for the respective authorised power for the type of station licence held by the licensee. Currently there are no Digital Standards in force at this time. It has been agreed by the ACMA that the authorised RF power will be determined by the Mean Power method under a signal input that produces an "idle" (no information being sent) condition. The reasoning is that in the case of frequency or phase digital emissions the level of the RF signal is relatively high levels with some variations in RF output power under modulation conditions. For digital emission modes that are pulsed, eg ARQ modes, to determine the RF power Mean Power will be the method employed. One of the licence conditions on all amateur station licence is the requirement to comply with the Human Exposure Limits. Information is available here on this website, accessible by clicking "Amateur Radio EMR Emissions" in the left hand menu.